Translocation of tattoo particles from skin to lymph nodes. 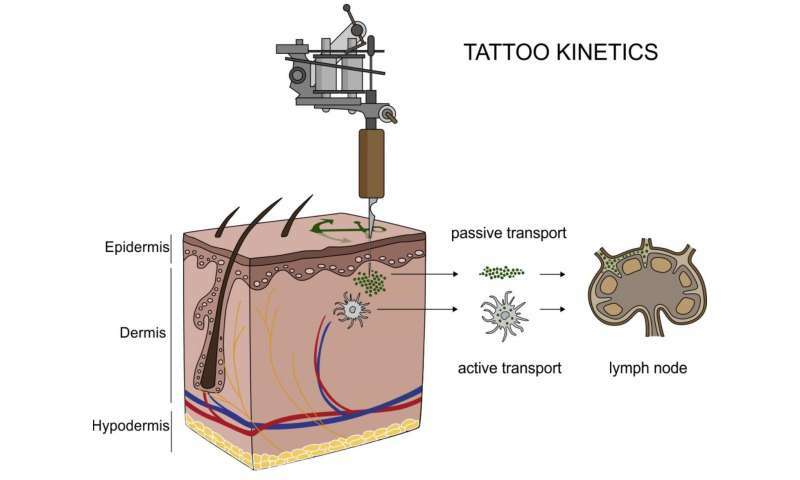 Upon injection of tattoo inks, particles can be either passively transported via blood and lymph fluids or phagocytized by immune cells and subsequently deposited in regional lymph nodes. After healing, particles are present in the dermis and in the sinusoids of the draining lymph nodes. Credit: Christian Seim. The elements that make up the ink in tattoos travel inside the body in micro and nanoparticle forms and reach the lymph nodes, according to a study published in Scientific Reports on 12 September by scientists from Germany and the ESRF, the European Synchrotron, Grenoble (France). 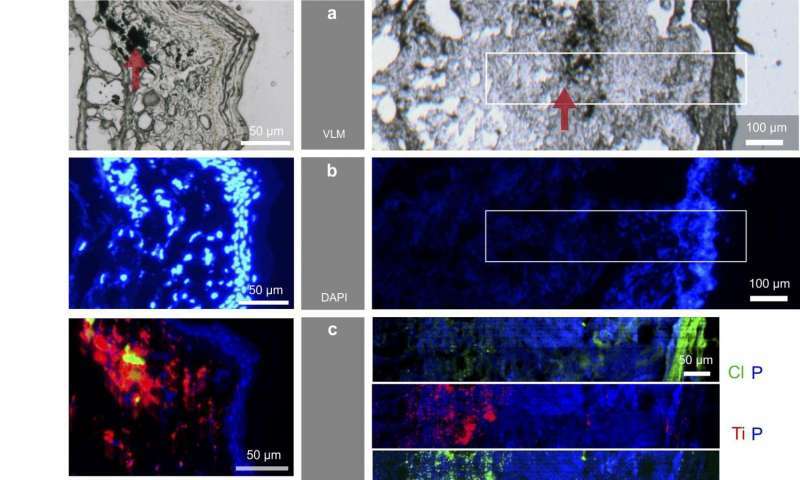 It is the first time researchers have found analytical evidence of the transport of organic and inorganic pigments and toxic element impurities as well as in depth characterization of the pigments ex vivo in tattooed tissues. 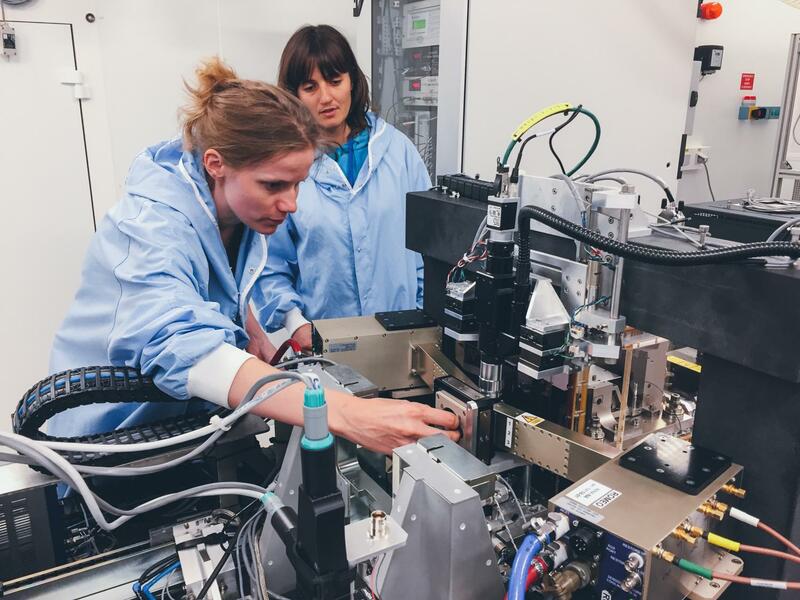 Two ESRF beamlines were crucial in this breakthrough. “When someone wants to get a tattoo, they are often very careful in choosing a parlour where they use sterile needles that haven’t been used previously. No one checks the chemical composition of the colours, but our study shows that maybe they should,” explains Hiram Castillo, one of the authors of the study and scientist at the ESRF. The reality is that little is known about the potential impurities in the colour mixture applied to the skin. Most tattoo inks contain organic pigments, but also include preservatives and contaminants like nickel, chromium, manganese or cobalt. Besides carbon black, the second most common ingredient used in tattoo inks is titanium dioxide (TiO2), a white pigment usually applied to create certain shades when mixed with colorants. TiO2 is also commonly used in food additives, sunscreens and paints. Delayed healing, along with skin elevation and itching, are often associated with white tattoos, and by consequence with the use of TiO2. The hazards that potentially derive from tattoos were previously known only by chemical analysis of the inks and their degradation products in vitro. “We already knew that pigments from tattoos would travel to the lymph nodes because of visual evidence. The lymph nodes become tinted with the colour of the tattoo. It is the response of the body to clean the site of entrance of the tattoo. What we didn’t know is that they do it in a nano form, which implies that they may not have the same behaviour as the particles at a micro level. And that is the problem—we don’t know how nanoparticles react,” says Bernhard Hesse, one of the two first authors of the study and ESRF visiting scientist. X-ray fluorescence measurements on ID21 allowed the team to locate titanium dioxide at the micro and nano range in the skin and the lymphatic environment. 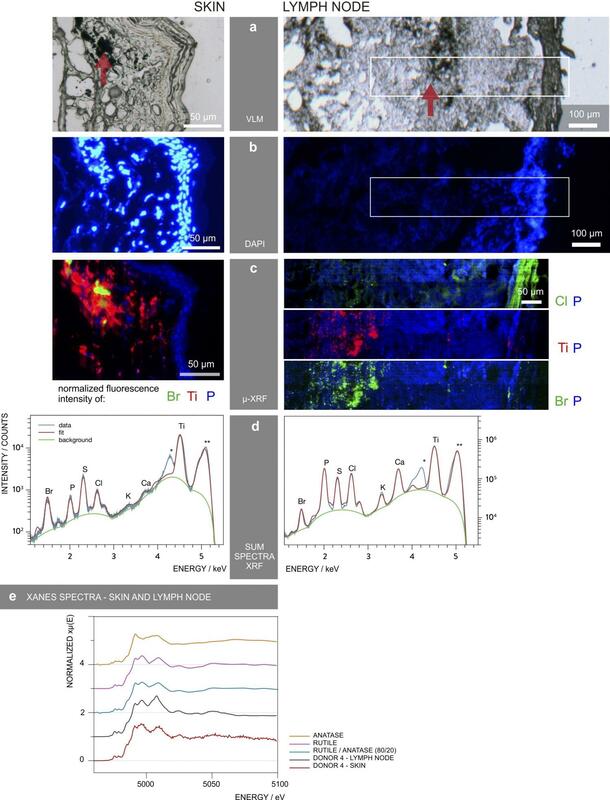 They found a broad range of particles up to several micrometres in size in human skin, but only smaller (nano) particles were transported to the lymph nodes. This may lead to the chronic enlargement of the lymph node and lifelong exposure. Scientists also used the technique of Fourier transform infrared spectroscopy to assess biomolecular changes in the tissues in the proximity of the tattoo particles. 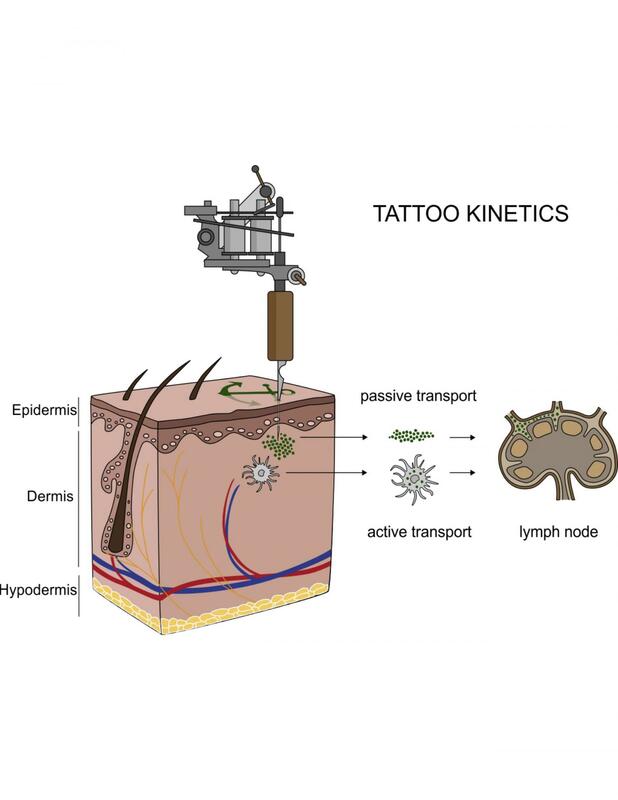 The scientists report strong evidence for both migration and long-term deposition of toxic elements and tattoo pigments, as well as for conformational alterations of biomolecules that are sometimes linked to cutaneous inflammation and other adversities upon tattooing. The next step for the team is to inspect more subjects with adverse effects from tattoos in order to find links with chemical and structural properties of the pigments used to create their tattoos.